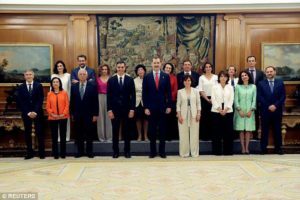 Just over a fortnight on from the Motion of Censure in the Cortes which made Pedro Sanchez Spain’s new Prime Minister and the PSOE leader has announced his cabinet. I’ve not seen any British reporting of this – I’ve been in Spain – but it’s certainly hit the headlines. How long his minority administration will last we shall see, he is dependent on a broad coalition which includes both Basque and Catalan parties, but he started in fairly spectacular fashion with the appointments to his Cabinet. Spain now has the highest percentage of women (64.7%) at this level in Europe or America ( according to the OECD ) with women occupying eleven of the seventeen posts. Startling and eye-catching and all over television news. There are also people outside the politics, an astronaut (male) as Science Minister and a former journalist (male) as Minister for Culture and Sport. The latter, Maxim Huerta, has already caused a scandal, resigning when it emerged that he had been fined for tax offences (though he insists this only came about because the law was changed retrospectively). There are other appointments which indicate how this government might approach one of the thorniest issues, that of Catalan independence. Josep Borrell is Foreign Minister and Meritxell Batet is Minister for the Regions (a loose translation). Both are Catalans. 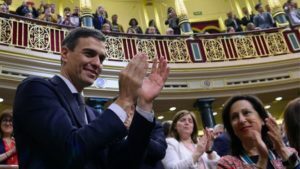 The former is a longstanding opponent of separatism, though those with long memories will recall that he served in the government of Felipe Gonzales, the socialist PM who brokered a deal with the Catalans which passed in both the Generalitat and the Cortes only to be stymied by Mariano Rajoy and the PP in the courts. In my opinion, Borell is there in part to reassure parliamentary opponents and their constituencies that Sanchez government isn’t ‘soft’ on separatism. Yet one of the first acts the new government has committed to is to lift the budgetary controls on debt-ridden Catalonia, which was closed out of the financial markets during the crisis of 2008 and has relied on central state funds since. 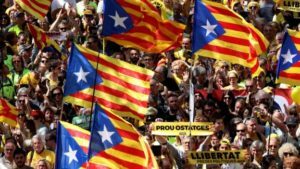 The Catalans still have to report to Madrid on their spending, but the restrictions are not so harsh and this has to be seen as a signal that the relationship between centre and region can return to some sort of normality. Fingers crossed. The new administration has already shown a change of approach and style. 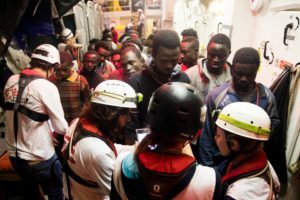 Sanchez announced that a boatload of African refugees (over 600 of them) previously seeking landfall would be welcome to come to the port of Valencia. The ship, the Aquarius, rescued the refugees from several inflatable boats off Libya and they include several pregnant women and over a hundred unaccompanied minors. It had already been turned away from ports in Italy and Malta and was running out of options. A government spokeswoman said that this was more than a humanitarian act, it was also a signal to Europe that it had to do something about the growing refugee problem in the Mediterranean. A very different approach from that of Sanchez’ predecessor, the hardline Rajoy and his PP. Cities and towns around Spain have been offering to take some of the refugees in. With only 84 seats out of 350, who knows how long this government will survive? Every remotely controversial measure would require his administration to canvas support within the Cortes to see it enacted and there are all sorts of political fissures within the centre and centre-left. Not to mention Basques and Catalans. Sanchez has said that he will call new elections, though he hasn’t set a timetable yet. Watch this space. This entry was posted in From a Foreign Field, Political comment and tagged Foreign field, Political comment by juliej. Bookmark the permalink.